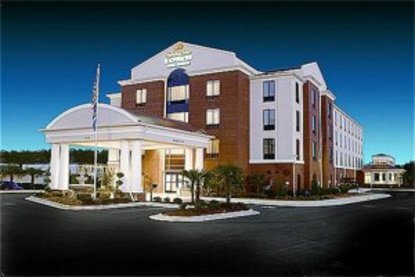 Take a Virtual Tour of the hotel.The Holiday Inn Express Hotel & Suites McDonough, GA, is conveniently located off I-75, just south of the beautiful city of Atlanta and within minutes of the Hartsfield-Jackson Airport. Perfect for both the corporate and leisure traveler, the hotel is at the center of large corporations such as Norfolk, Facet Technologies, Luxxotica, and Millard to name a few. A short 25 minute drive will put you at the heart of Atlanta&regs entertainment center hosting the Atlanta Braves&reg Turner Field and the Atlanta Falcons&reg Georgia Dome. Other nearby attractions is the World of Coke, Georgia Aquariaum, Atlantic Station, IKIA, CNN Building, Centennial Park and Six Flags. We invite you to join us for a &regSuite Experience&reg Our hotel is the finest of luxury and service in and all Henry County, offering spacious suites that include a microwave, refrigerator, work desk area and complimentary High Speed Internet, as well as, our Simply Smart Bathroom amenities. In addition the hotel offers an indoor pool, fitness center, Jacuzzi, a business center and our famous complimentary Express Start Breakfast. Our meeting space has been designed to accommodate any corporate event. No matter how you look at it, we are the SMART place to stay Visit McDonough, GA and stay smart at the Holiday Inn Express Hotel. This hotel is committed to providing accessible facilities under the American Disabilities Act. If your accessibility needs are not met, please contact the Hotel Manager on Duty. Should you require additional information regarding accessible facilities for guests with disabilities, please call 1-800-Holiday (U.S. and Canada) or contact the hotel directly. For the hearing impaired, TDD service is available at 1-800-238-5544 within the U.S. and Canada.